It was her Winter Ghost. 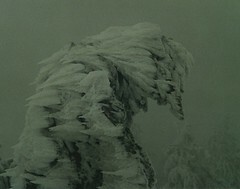 It was a bent old pine that had frozen over many many times, so many that it stayed frozen even through summer. It was not an evergreen anymore. It had been transformed into something much more beautiful. At first, she used it when she was a little girl, and she would get sad. She might have been teased at school that day, or maybe she fell and scraped her knee. The Winter Ghost would make it okay. Then she had used it when her mom yelled at her, for going out to some movie or other without her parents’ permission. The Winter Ghost didn’t mind. Once, she had been found out with a boy. The boy had several other girlfriends. It broke her heart. But the Winter Ghost’s frosty needles made her heart warm. She had had an argument with her father. An argument so fierce, he had threatened to kick her out of the house. She cried. The Winter Ghost shielded her from life’s cruel blows. One day she went away with the Winter Ghost. The Winter Ghost went with her. that is sad. i like the flashbacks though. and the imagery.